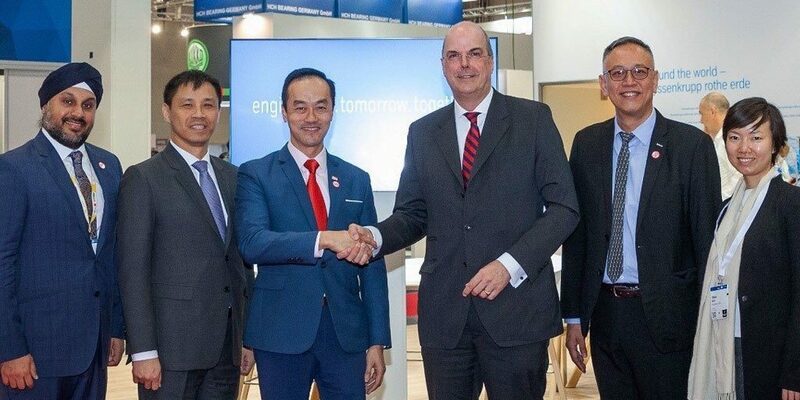 German conglomerate ThyssenKrupp has announced at Hannover Messe 2019, that they would be establishing an Additive Manufacturing TechCenter Hub in Singapore later this year. The announcement outlined the company’s initiative to bring their engineering and innovation expertise closer to customers in Singapore and the Asia Pacific region. The move was shared by Dr. Donatus Kaufmann, executive board member of ThyssenKrupp AG with Singapore’s Senior Minister of State for Trade and Industry, Dr. Koh Poh Koon, on 3rd April who was visiting at the world’s leading trade fair for industrial technology in Hannover. Singapore is at the forefront of additive manufacturing growth with the government pushing for Industry 4.0 adoption across industries, and the Asia Pacific AM market is projected to grow to more than $5.5 billion by 2025 according to a 2016 Frost & Sullivan report. Additive manufacturing is also included as a key enabler in the Research, Innovation and Enterprise 2020 (RIE2020) Plan of Singapore, which is the country’s roadmap for research and development. With support from the Singapore Economic Development Board, the new hub will serve as a regional hub for the company’s Mülheim TechCenter that was established in 2017. Besides strengthening their presence in Singapore and the Asia Pacific region, ThyssenKrupp will also get the chance to leverage on Singapore’s innovation ecosystem and further aid additive manufacturing research in the region and beyond. In addition, additive manufacturing engineers working in Singapore will work with those based in Germany to develop various metal and plastic additive manufacturing products and solutions for customers in automotive, capital goods, chemical, mining, and other heavy industries. The company had earlier signed a memorandum of understanding (MoU) between Singapore’s Defence Science and Technology Agency (DSTA) and ThyssenKrupp Marine Systems in February 2019. The MoU involves working on new technologies such as additive manufacturing for naval applications. © 2012-2019 Creatz3D. All Rights Reserved.